What ho, readers! It has been a sad year for aficionados of the blessed Countdown, that stimulating stop-gap between lunch and the first snorter of the evening. I am sure I speak for many people who will miss the genial and quirky Richard Whiteley, who gave the programme much of its unique spirit. Of course, La Vorderman is as appealing as ever and the Mem speaks highly of that new presenter chap with a moustache, but our afternoons will no longer have the same charming Englishness and slightly eccentric edge. On a more positive note, the Mem decided we should make constructive use of the extra time in mid-afternoon, when Countdown was off our screen. Decorating and gardening were to be avoided, so I opted to catch up on my reading, which normally doesn't extend much beyond the latest Alan Bennett or Bill Bryson. It's funny, but when I put together a list of my favourites during this period, a theme emerged: all the books were biographies, but a good proportion of them described childhood. They also demonstrated the sad truth that this time of life is not invariably happy and depicted how problems or conflicts were tolerated or overcome . I hadn't consciously decided to look out books of this type, but whatever the deep psychological motives for my selection, here are five of the biographies I have enjoyed reading most over the past six months. Having been fascinated by Hong Kong since my first visit, I was immediately interested in Gweilo by Martin Booth (Doubleday). The book is subtitled, "Memories of a Hong Kong Childhood" and paints a realistic picture of the author's life as a bright and inquisitive seven-year old around the vibrant streets of the colony in the early 1950's . The licence given to the boy due to his blond hair, which signified good luck to the Chinese, enabled him to experience a local world normally hidden to foreigners. There is a dual backdrop to the story: the exotic location and Martin's warring parents. His mother was broad-minded and interested in Chinese culture, whilst his bitter and bigoted father was preoccupied with preventing his wife and son from "going native". The book recreates the boy's wanderings around the bustling streets, shops and stalls. He visits parts normally closed to a gweilo, or pale fellow, such as the forbidden Walled City and encounters incredibly colourful people, with names such as Nagasaki Jim and the Queen of Kowloon. "Gweilo" is a remarkable evocation of both place and emotion: one can almost taste and smell Hong Kong and empathise with the discomfort of a child with a father at odds with both his wife and son. It also implicitly advocates open-mindedness and receptivity to new experiences. I found it engrossing. The Road to Nab End by William Woodruff (Abacus) is a bestselling autobiography and is subtitled "an extraordinary northern childhood". It evokes a life of extreme poverty from Woodruff's birth in 1916 in a Lancashire cotton mill until he broke free to find work in London. This beautifully written book recreates the author's childhood and key figures such as his grandmother, parents, siblings and a range of characters from a deprived community in Blackburn. Woodruff's stories ensure that no one has a sentimental vision of working class life, the truly tragic impact of poverty and the absence of any effective welfare safety net. The Woodruff family history and William's own story is lucidly and absorbingly told in a way that amounts to social history. Anecdotes depicting experiences at home with the family, in the neighbourhood, at school and at work help one understand the development of the mindset that led him to leave for the South to pursue a chance of self improvement and a better life. The sequel to The Road to Nab End is Beyond Nab End (Abacus) which picks up the story in 1933. Sixteen year old William Woodruff leaves Lancashire in the depth of the depression to seek a job in a foundry in London. The un-glamorous way of life in the East End in seedy digs and with seedier fellow tenants is described with an almost photographic clarity, enabling one to empathise with his determination to progress and seize upon education as the route to progress. The events of the time are effectively evoked from street fights with the Blackshirts to the War and ultimately to Oxford University. This story of success against the odds is vividly told in a way that avoids sentimentality and is ultimately inspiring. It is a book to encourage vision, determination and hard work and to shame the lazy or complacent. My next recommendation is Keeping Mum by Brian Thompson (Atlantic books). On the cover Michael Frayn comments "A wonderful book that brings vividly to life one of the oddest childhoods I've ever read about". I agree entirely; this description of wartime childhood is both vivid and odd. It is also compelling since, just as in Gweilo and the Nab End books, the reader is fascinated to learn how a child from this unpromising background could grow up to become a successful author. Brian Thompson's childhood features two huge characters: his outrageous depressive mother who ranges between going out with GIs and being the belle of the school dance to a chainsmoking recluse and a talented, driven but ultimately bitter, father, absent in the war and afterwards pursuing his career. A boy's-eye view of a strange adult world growing up in Cambridge and London is funny and touching and graphically depicts the winding road to adulthood. Again, the picture isn't rose tinted and one wonders how, after so many hard knocks, a successful author emerged. One also wonders how damaged the adult may have been by the process - but most autobiographers tend not to share this with us. "Keeping Mum" is lively, refreshing and entertaining and just a little bit strange. Finally, I want to recomend to you my favourite book of the past year, Bertie, May & Mrs Fish by Xandra Bingley (Harper Collins) . I praised this book highly in a review of horsey books elsewhere, but make no apology for doing so again. I still agree with Jilly Cooper, who described it as "utterly enchanting and quite unputdownable". 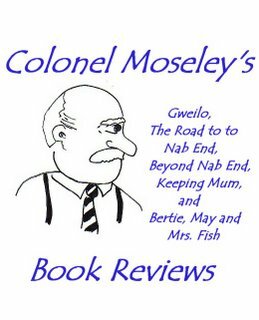 It is subtitled as "Country Memories of Wartime", but is much more than a simple memoir. I can best describe the style as impressionistic; without self consciousness, the author often uses a stream of impressions, sounds, sights and feelings to convey her experience in a way that is almost like cutting in film. The book evokes country life through the eyes and ears of a pony-mad, young girl. Without ever being cosy, it depicts the wonder of childhood along with a sometimes complicated and harsh post-war, adult world. The evocation of rural pastimes, conversations, smells and tastes is sensual, authentic and remarkable. Like the other books Xandra Bingley's early life has a darker edge, stemming, in particular from her father's infidelity. This is conveyed with a light touch appropriate to a child's perspective. The book reflects acute powers of observation and a strong sense of time, place and mores; it is writen with genuine panache and is a remarkable first publication. I hope you enjoy my recommendations and come to share my enthusiasm for each book. They are all different, but are well written in a way which depicts time, place and people authentically. In each case the author was strong and individualistic and underwent some form of struggle to become successful. Each, in a different way, demonstrates the truth of Wordsworth's line that "The child is father of the man". Pip, pip!